Everything is bursting out now - magnolias are budding, forsythia are glowing...it's actually all happening a bit later than usual for some reason - surprising since it's been a warm end-of-winter. The snow from a few days ago melted in just hours. 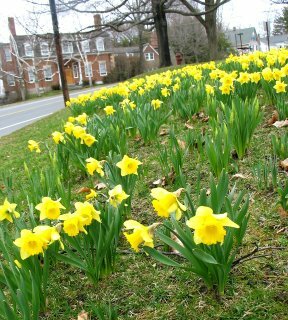 Daffodils are a sure sign of spring. Is the Sharon playhouse still in business? Are the Congregational Church and the Hotchkiss Library still facing the Green?